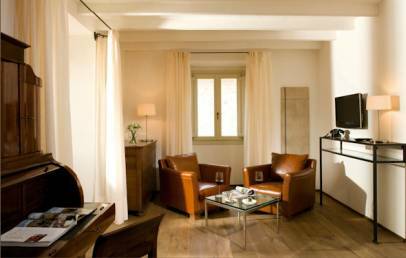 Palazzo Seneca Maison & Gourmet is located in Norcia, a lovely town in the Province of Perugia. In the surroundings of the Relais you may plunge into the rich historical-artistic patrimony of Norcia and discover this amazing culinary destination. Palazzo Seneca is also an ideal starting point to visit the mountainous nearby and a base for mountaineering and hiking. Perugia airport distance approximately 100 km. 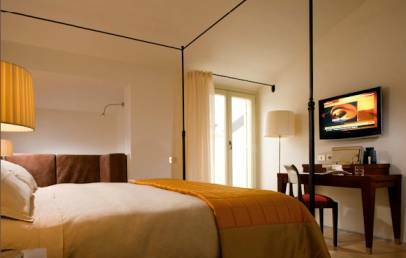 Palazzo Seneca is usually described as "a house in an Umbrian Palace" because of its historical value and the welcoming philosophy. 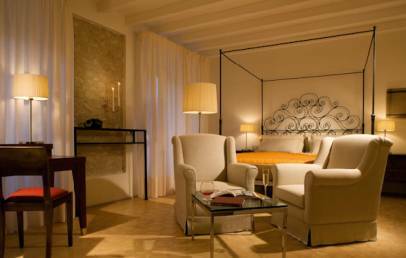 Dated back to the sixteenth century, the Palace has been carefully restored by the Bianconi Family to offer a charming accommodation characterized by a blend of design and tradition, simplicity and quality. On the first floor is the Wellness Centre and the 24 rooms and suites with modern comforts and unique details, are spread over the upper floors. Palazzo Seneca consists also of the Vespasia Restaurant which offers, for lunches and dinners, a gourmet cuisine based on the Umbria traditional recipes and a pinch of new gastronomic tradition. Breakfast is served at Palazzo Seneca Lounge on the ground floor. Located on the ground floor, the Wellness Centre of Palazzo Seneca presents a stone hydro-massage bath for 6 people, a Turkish bath and sauna. Guests can also choose among holistic, ayurvedic and abdominal massages, aromatherapy and plantar reflexology just to cite a few. “Spirit of Service” is the leitmotif of all high quality services of the Palazzo Seneca Maison & Gourmet. The welcoming staff is at your disposal for any information and suggestion about trips, excursions and activities. Warm and welcoming double room furnished in modern style and characterized by precious detail like the writing desk covered with leather and the Cardinal style chairs. 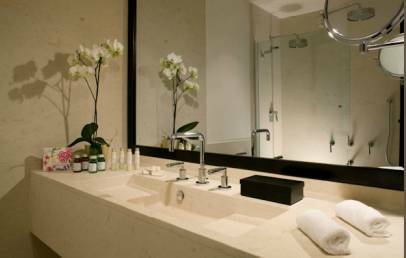 The bathroom, with Umbrian cotto and prestigious marbles, is equipped with shower. The Romantica room face the roofs of the old town. 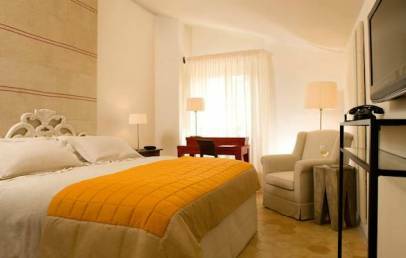 Large and warm double room furnished in modern style and all different each other in the precious details. 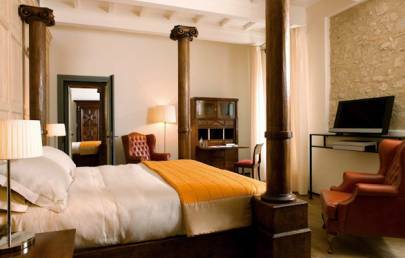 Some rooms are characterized by four-poster beds, writing desk covered with leather and the Cardinal style chairs. The bathroom, with Umbrian cotto and prestigious marbles, is equipped with shower or bathtub. Some rooms have a balcony and all face the roofs of the old town. Large and warm double room can host an additional 3rd bed. All different each other, the rooms are furnished with writing desk covered with leather and the Cardinal style chairs. Some of them are characterized by four-poster beds, others have wooden bed- heads sculptured by the skilled hands of Umbrian craftsmen. The bathroom, with Umbrian cotto and prestigious marbles, is equipped with shower or bathtub. Some rooms have a balcony and all face the valley. Elegant and warm Suite with lounge area, characterized by old oak floor and unique antique pieces like skilfully restored wardrobes and desk manufactured in 1500-1700. The bathroom, with black granite, is available with water fall shower or bathtub. The Junior Suite are located in the main facade of the Palace. 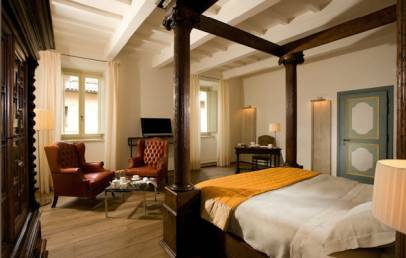 Exclusive, elegant and warm Suite with old oak floor and a unique bed characterized by wooden- twisted columns sculptured by Umbrian craftsmen. The Suite consists also of a living room and everywhere you find a timeless and fascinating atmosphere. The are two bathrooms, with black granite and bathtub. The Suite faces the terrace of the Palace and offers a panoramic valley view.